In as little as nine months, a Chinese-Danish joint venture named Arcon-Sunmark Large-Scale Solar Systems Integration built its first solar district heating plant in Tibet, commissioning the installation in mid-December 2018. The system consists of 22,275 m² of flat plate collectors and a seasonal pit storage with 15,000 m³. “We intend to play an integral role in the development of SDH in China,” said Aaron Feng Gao, CEO of the Beijing-based joint venture (see photo). The 30-staff business founded in 2016 expects to launch new SDH projects in Tibet this year. Arcon-Sunmark Large-Scale Solar Systems Integration is a project management firm that designs and installs SDH turnkey systems. One example of its work is the SDH system it put up in partnership with Danish-based Arcon-Sunmark in the Tibetan town of Langkazi. “We were fortunate enough to have some very experienced engineers who know how to build a solar system in conditions as challenging as those of Tibet,” said Gao. Major difficulties were the extreme weather in this part of the world and the logistics of getting personnel, equipment and material to the town. The installation in Langkazi is expected to meet 90 % of the space heating requirements in buildings with 82,000 m² of floor area or more. The contribution is that high because solar energy will only be used for providing thermal comfort in the heating season, so that the energy collected in summer will be directed to the pit storage. Centralised systems producing hot water for showering are not common in these parts of China. The owners of the Langkazi site said that customers were using electric tea pots when they wanted hot drinking water. The flat plate collectors were manufactured by Arcon Sunmark in Vietnam. 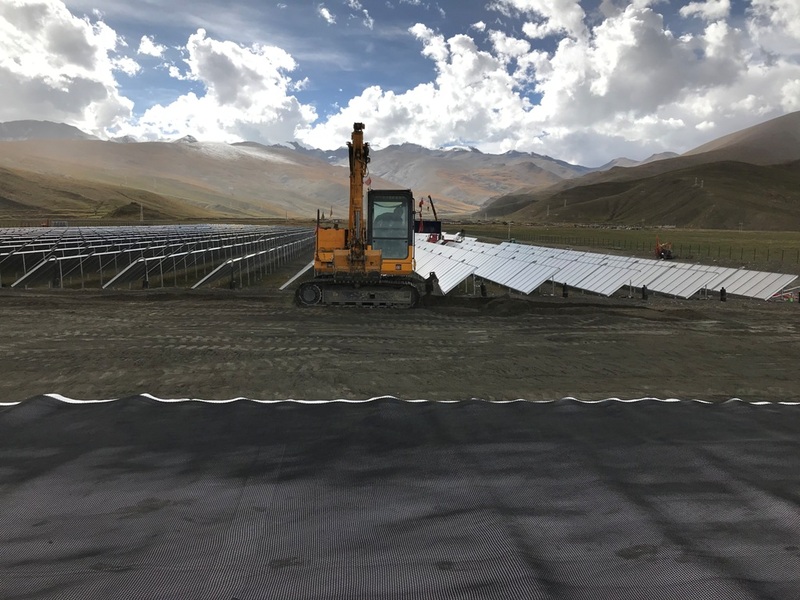 Due to the arid and sandy environment of the Tibetan Plateau, with an average elevation of 4,600 metres, the solar field needs to be cleaned twice in the dry season. The pit heat storage was very similar in design to that found at Danish district heating sites, although it had been slightly modified at the lid, the company said. Installing a solar field in the Tibetan mountains is a challenging task. When asked whether the government had tendered out any other work to support SDH in Tibet, Gao said that it was still too early to disclose any information on those projects. Gao is convinced that renewable heat generation via SDH could help solve some of the energy supply challenges faced by China. “We see great interest in using clean and efficient energy to meet growing demand for heat. Moreover, SDH shows competitive operating costs and is a safe investment, as it is proven technology with a long track record of success.” Towns in particular could benefit a great deal from SDH, where solar irradiation is high, land is available at comparatively low cost and the fossil fuel prices are high, for example, because of difficult transport routes.